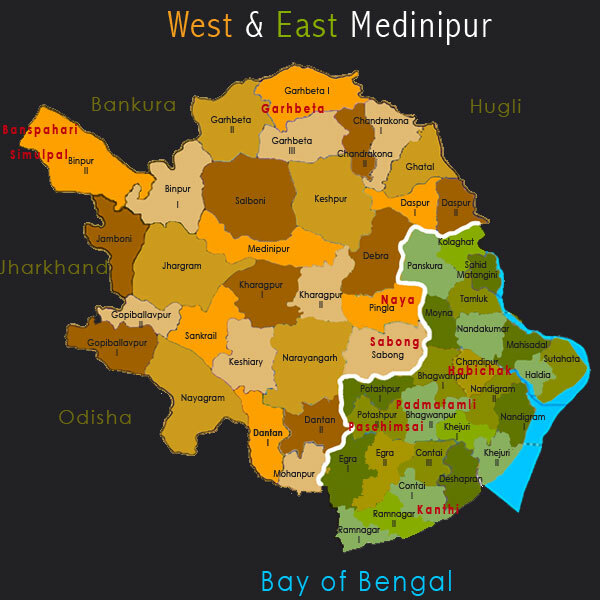 Undivided Medinipur, known for its great geographical diversity, was the largest district in West Bengal and India. It was bifurcated into two administrative units on January 1, 2002 – Pashchim (West) Medinipur, with its headquarters at Medinipur town and Purba (East) Medinipur, headquartered at Tamluk. The north and north-west of this region (West Medinipur) touches the eastern fringe of the Chhota Nagpur plateau and culminates in the red, gravelly laterite soil of the Rarh region. To the east (East Medinipur) are flat, rolling plains, along with the alluvial plains near the rivers and the sandy coastal plains of the south. The rivers Rupnarayan and Kosai or Kangsabati flow through both districts and the Subarnarekha and Haldi rivers through West Medinipur and East Medinipur, respectively. The Hooghly-Rupnarayan flows between Howrah district and East Medinipur. There are conflicting accounts of how Medinipur got its name: from a local deity named Medinimata or a 13th century chieftain named Medini Kar, or even from a tribal clan called Med. It is generally agreed that present day Tamluk and its adjoining areas on the banks of the Rupnarayan river is the site of the ancient city known as Tamralipta or Tamralipti. This site has been mentioned in the Mahabharata, the Puranas, ancient Buddhist and Jain texts, and in accounts of Greek geographers. It was noted for its monasteries in the travelogues of Fa Hien in the 5th century, and later by Hiuen Tsang (Xuanzang). This city was a thriving sea port connected with all the important trade routes of the time for about a thousand years, from the Mauryan era till about the 8th century CE when the river changed course. Various excavations around this site have yielded artefacts dating from the 3rd century CE back to the 3rd century BCE. The famous 2nd century BCE figurine of Yakshi at the Ashmolean Museum, University of Oxford was recovered from Tamluk; while in more recent excavations, a Buddhist monastery has been discovered. After Tamluk lost its importance, Hijli flourished as a sea port in the 16th century CE attracting colonial powers like the Portuguese, Dutch and the English. Undivided Medinipur, once part of ancient Kalinga, was ruled over by a succession of dynasties including the Nandas, Mauryas, Guptas and in the 7th century CE, by kings Shashanka and Harshavardhana. The region then came under the rule of Ganga kings of Kalinga for over four centuries before it fell to Afghan rule and subsequently, Mughal rule in the 16th century. It eventually came under the administrative control of the British East India Company in 1760. According to the 2011 Census, Paschim Medinipur had a total population of 5,943,300 of which 87.97% lived in rural areas while Purba Medinipur had a total population of 5,095,875 of which 88.37% lived in rural areas. The tribal population is concentrated in the northern and western areas of West Medinipur : the Chhota Nagpur hills and the arid lateritic uplands of the Rarh in undivided Medinipur with the Santals being the largest group who live here. Other tribes include the Bhumij, Mundas, Lodhas, Kodas, Mahalis and Kherias. The thickly populated alluvial plains in the east are peopled by a wide mix of castes. Over and above the various tribal languages spoken in the west and north-west, the prevailing language is Bengali, with Oriya also spoken towards the south. As a result of the diverse cultural backgrounds of the various communities, a very rich blend of the folk traditions of both tribal and non-tribal communities abounds in the region. Tribal religious rites and rituals are expressed through dances amid the jungles of West Medinipur. Tribal traditions include the festivals of Baha, Sohorai (celebrated as Bandhna by non tribals), Pata, Korom and which are celebrated with songs and dances. The Bhadu and Tusu festivals are celebrated by non tribal women. Tribal dances include the Chang (of the Lodha tribe), Lagre, Dangrey, Dnasai (also called Bhuang) and Saharul. The Gajan festival, in honour of Lord Shiva, is celebrated with song and dance by the Hindus, too. The rhythmic, lilting Jhumur songs, expressing the emotions and desires of the rural folk and sung in the various tribal languages of this region, are typical of the entire Rarh belt. It is often accompanied by dance and always by the dhol, madol and other percussive instruments. Other dance forms found in the region include the sensuous dance of the Nachni artist, who performs solo to a Jhumur song. Though the Chho dance is popularly associated with Purulia, Chho dancers are also to be found in the Jhargram, Belpahari and Gopiballavpur areas of Medinipur with the influence of Mayurbhanj Chhou quite prominent in the form practised in Belpahari. Glove puppetry or Beni Putul Naach, a dying form in West Bengal, has been reduced to a handful of artists based in the lone village of Padmatamli in East Medinipur. Both East and West Medinipur are home to the renowned and ancient art of the patachitra scroll paintings, which was once both a performance and a craft, but is now mainly a form of visual art. 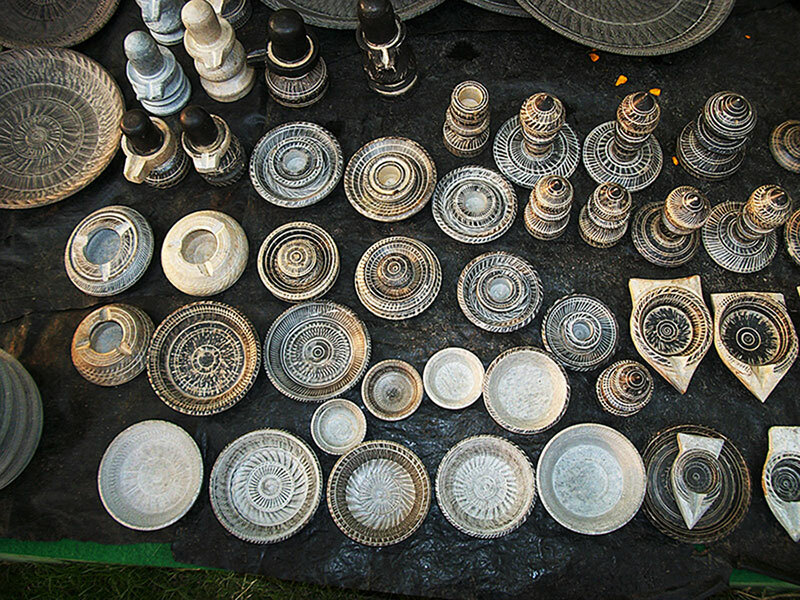 Other spheres of folk art well known in the district include cane, reed and bamboo basketry, dokra art, the exquisite Masland mat weaving and items carved from stone. Terracotta pottery too is an ancient folk tradition, though its household use in the form of pots and pitchers has reduced. But terracotta for ritual use continues to this day with small votive figures (Chhalan Murti) of horses and elephants being offered as worship. 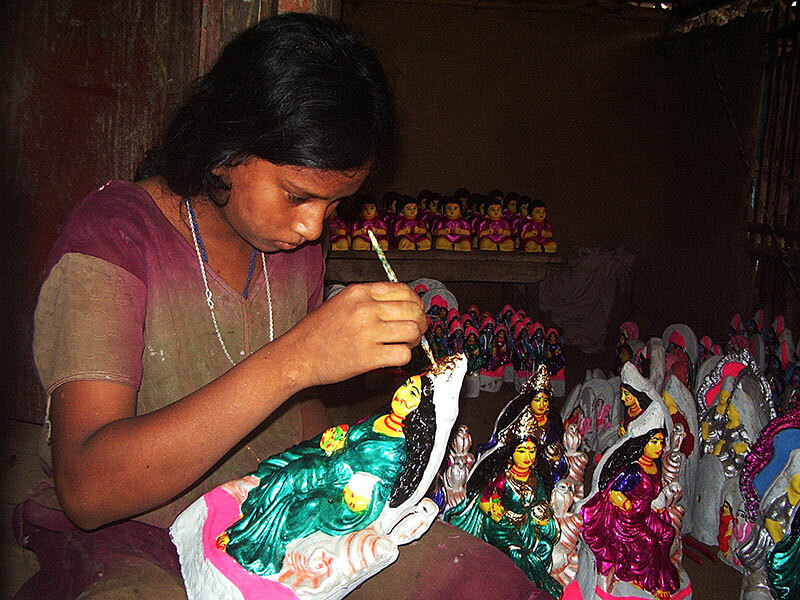 Colourful clay dolls of Narajole continue to be popular while a special type of clay doll called Diwali Putul, used as a lamp, also continues to be made. Lac coated dolls or Galar Putul is a dying art with just a single artist left.